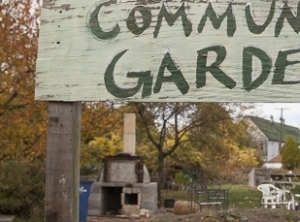 Much has changed since then, and we've been back twice to learn from Detroiters -- more impressed each time. The most recent time, three of us went to Detroit for an ordinary-people conference called “Reimagining Work” – rich in content and in democratic deliberations. Some quotes and some commentary on the conference are here. We arrived in Detroit pretty late in the evening, 8 of us returning from our rather unsuccessful visit to last year's Nobel Prize winner Lin Ostrom (for her work on "governing the commons") in Bloomington, Indiana. She was very hospitable and so were her colleagues, but our group was not a good fit - we couldn't really explain ourselves, and they were pretty distracted about getting a big healthcare grant for their university. 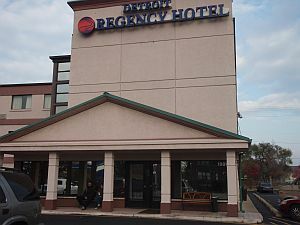 The Detroit Regency is not the Beverly Hills Regency, but it's very cheap and in a great location very close to the waterfront but not in the built-up part of downtown. The office where we registered was protected by bullet-proof glass, as was the Macdonald's where we went to the bathroom the next day -- a first. "Oaklanders, in the friendliest possible way, kept giving me sombre warnings about Detroit, as if it were a netherworld filled with immediate, certain peril. Don’t go after dark, they advised; never stop directly behind another car; never ask for directions; never honk." "...Oakland County has programs that court foreign biotech, biomedical, and alternative-energy companies, and that encourage life-science companies to collaborate with universities and hospitals. The county is getting into cloud computing. 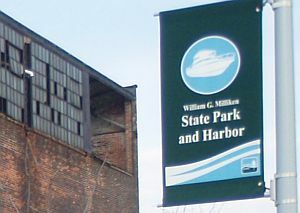 A thousand companies from forty countries, many from Germany and Japan, have set up operations in Oakland County; among them are Siemens, Volkswagen, Honda, and Toshiba. As Detroit tried to right itself by borrowing and spending—Q-tips applied to a cut jugular—Patterson’s administration froze government hiring, eliminated positions through attrition, and reconfigured pension and health-care plans." Anna Clark, Detroit Magnate decides he doesn't want 6000 blighted properties after all. Nov.5 2014, Next City. 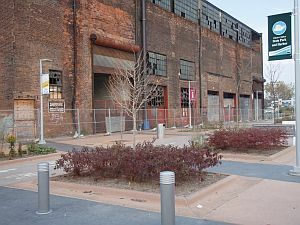 "The surprise cameo by an opportunistic developer skewed the city’s intentions for these properties and even worse, set up a scenario that would likely work against the city’s redevelopment strategy. In interviews, it was apparent that Strather had not a clue about what he would do with all this real estate or even what he legally could do." "....nobody was expected to bid on this particular blight bundle. With no purchaser, the properties were expected to be transferred to the land bank, which would use the money from selling the good properties to pay for demolition on the bad properties." 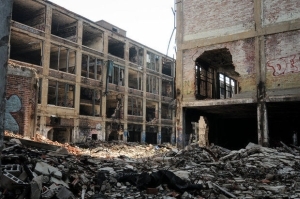 The 3.5 million square ft. former Packard Plant (it closed in 1958 and was unused from 1990) was bought by a Spanish developed, Fernando Palazuelo, who says he lost all his money in the 2007/08 crash in Spain and then moved to Lima Peru to start over. He bought the plant for $405,000 plus unpaid taxes of $79,000, after two other offers fell through. On November 5 2014, there was a public meeting about his plans. The plans for tenants seem to include seniors' housing and for business "the hope is to maybe attract dozens more non-manned aircraft companies, making it a drone hub."